In a move to bring the State of Manipur on ‘Tiger Map’ of the country, the first ever tiger census will be conducted in Manipur as part of the All India Tiger Estimation which was organized after every four years all over the country. The first of its kind exercise would also cover the collection of evidences for presence of other big carnivores and herbivores, the State Forest Department sources said. It is a known fact that tiger is on the apex of the food chain in a forest eco-system; hence its presence would indicate the good health of the habitat and availability of habitat for various co-predators and herbivores. If the presence of tigers is noticed, it will be a great achievement for the State to develop tiger tourism in the state, it added. The Department is optimistic over the fact that even if the habitat is found, the Department may go for introduction of tigers from other parts of the country as done in various tiger reserves with the help of National Tiger Conservation Authority (NTCA), Government of India. 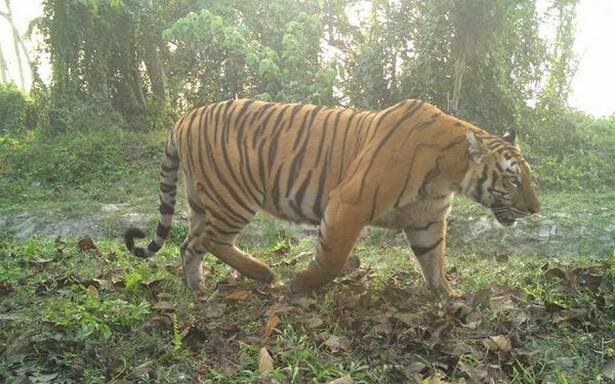 There are potential areas of tiger’s presence in the State particularly, Tamenglong, Ukhrul and Senapati districts, according to official sources. The reports are being received regularly from the villagers of these areas regarding movement of tigers. For the smooth conduct of the census, a three-day training programme of forest field staff of the State has been formally inaugurated under the aegis of NTCA and the State Forest Department at Forest Department office in Imphal on Saturday. The training programme which was inaugurated on Saturday would continue till February 5 at Imphal and in Tamenglong. Thereafter, scientists from Wildlife Institute of India will stay in Tamenglong, Ukhrul and Senapati Districts up to May 31, 2018 and work in coordination with local forest staff for estimation of presence of tigers in the State. The Additional Chief Secretary (Forests & Environment) Shambhu Singh, Principal Chief Conservator of Forests and Head of Forest Force K Angami, Inspector General of Forests (IGF) D P Bankhwal of NTCA, PCCF (FCA and Climate Change) N Kipgen and PCCF (Wildlife) DJN Anand were the chief guest, president and guests of honour of the inaugural function respectively wherein Additional Chief Secretary Shambhu Singh emphasized the importance of collection of evidences of tiger’s presence and maintaining the prey base for the big cat while IGF Bankhwal of NTCA was optimistic about presence of habitat for tiger in Manipur.